The Athenian House aims to revive the richness of the Athenian gastronomy, restoring Greek cuisine to its original Mediterranean values, based more on olive oil, vegetables, fine foods and regional ingredients sourced all around Greece. The restaurant uses new cooking technologies to transform traditional Greek dishes into gourmet creations with a modern twist. Dining becomes a memorable gastronomical journey throughout different regions of Greece, within the vintage aesthetics of white pure porcelain, Victorian silver cutlery and sparkling crystals. Dimitris Skarmoutsos, the Executive Chef, is one of the mosts famous Greek chefs and currently participates in the Greek TV show Master Chef since 2015. Today he presents the television series Blind Taste, along with the brand new Master Chef series 2017. 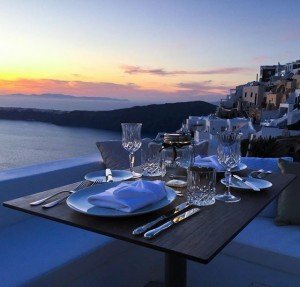 The Athenian House in Santorini is his first gourmet restaurant.